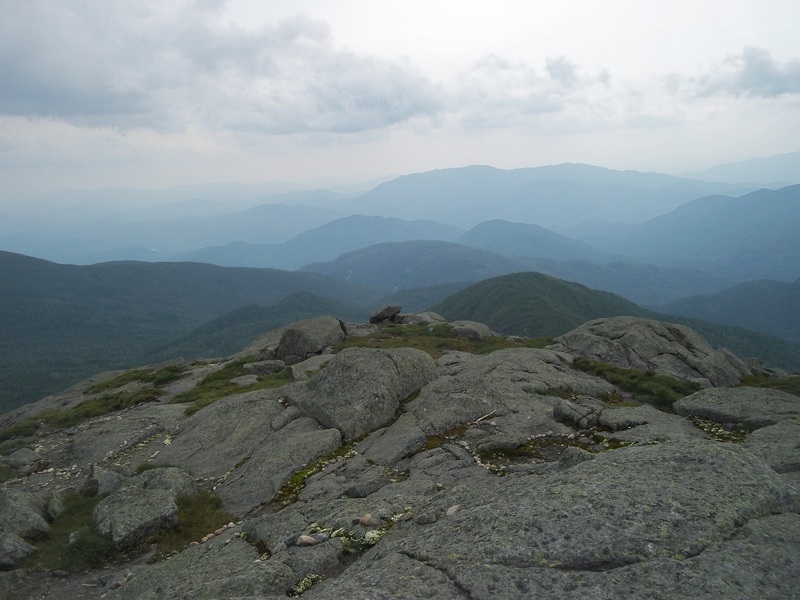 I completed my longest hike to date on Friday, the 18+ mile loop from the Loj of Gray, Skylight and Marcy. I hiked with a new friend and hiking buddy from the High Peaks Meetup. It was nice to share this journey with someone not only for the company and safety factor but also for the motivation – 18 miles and 3 summits is no easy feat. 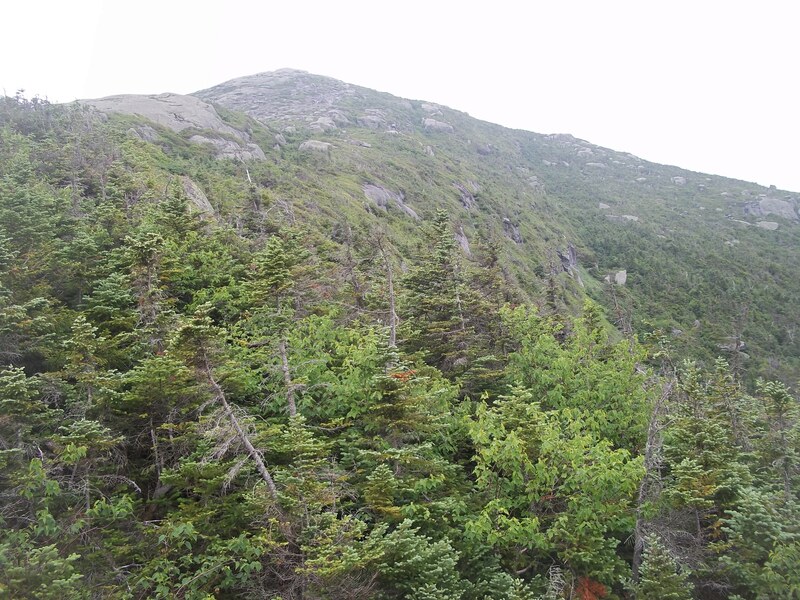 All 3 mountains are in the top 10 in height, including Marcy at #1, though the length of this hike was definitely where the biggest challenge lay. I didn’t take as many photos this time around because I wanted to be able to keep a good pace. I took a handful during the hike itself and a few at each summit but I wish I had photos from every leg of the trip – I always notice that the most beautiful places are the most remote and hardest to reach, and that is something that always provides motivation to push onward. 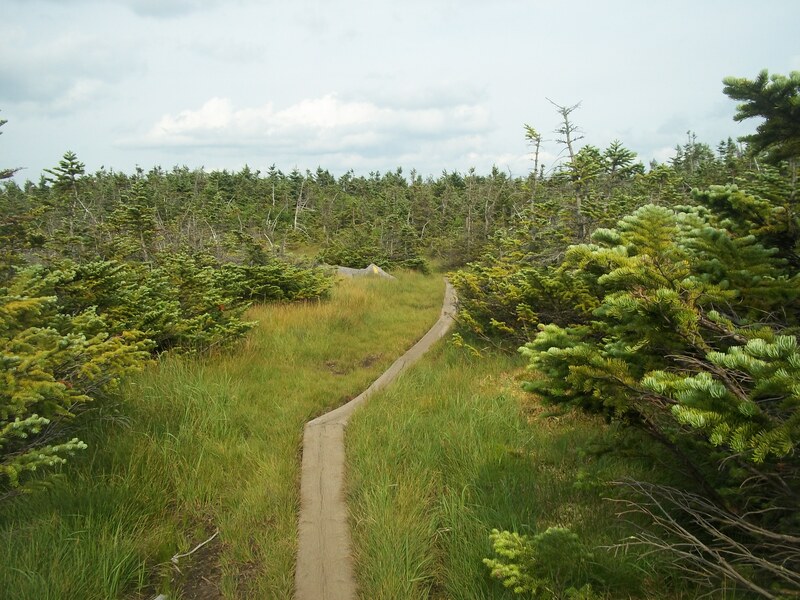 In this loop I fell in love with the stretch between Lake Arnold and the Feldspar Brook Trail in particular – the balsam forest and bright green vegetation gave it a mystical quality. I hope to walk through it again someday. I did not particularly like Gray, which we climbed first. 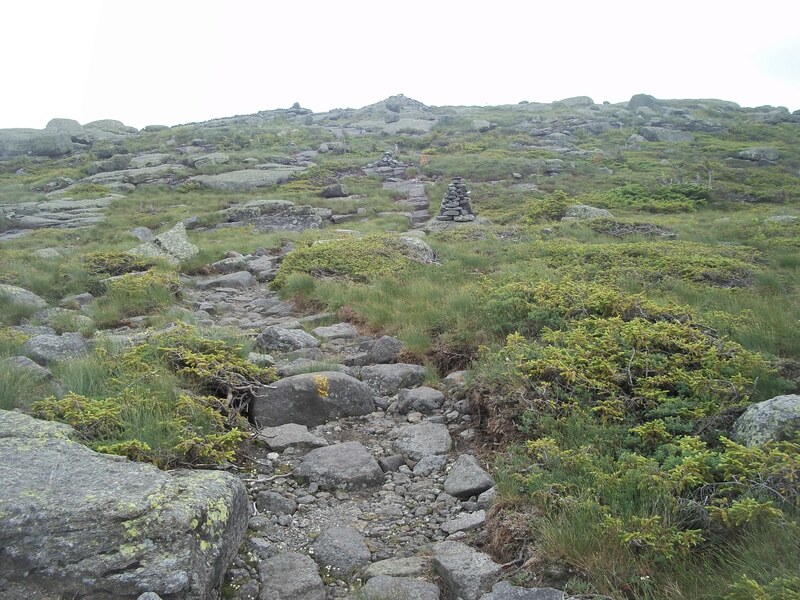 It is the tallest of the trailless peaks, though there’s a pretty distinct herd path to the summit. I’ve heard that it’s the easiest of the three, but I personally found it to be the most difficult. That might be because there were a few vertical rockface challenges that were daunting to someone who is only 5’2. I had a fall coming down from the summit that had the potential to be nasty and caught myself by looping my arm around a branch, which I luckily managed to do without hurting myself. Skylight had a gorgeous bald summit; I’ve been hearing for ages about the views from this mountaintop. The alpine meadow just below the rocky peak definitely added to its charm. 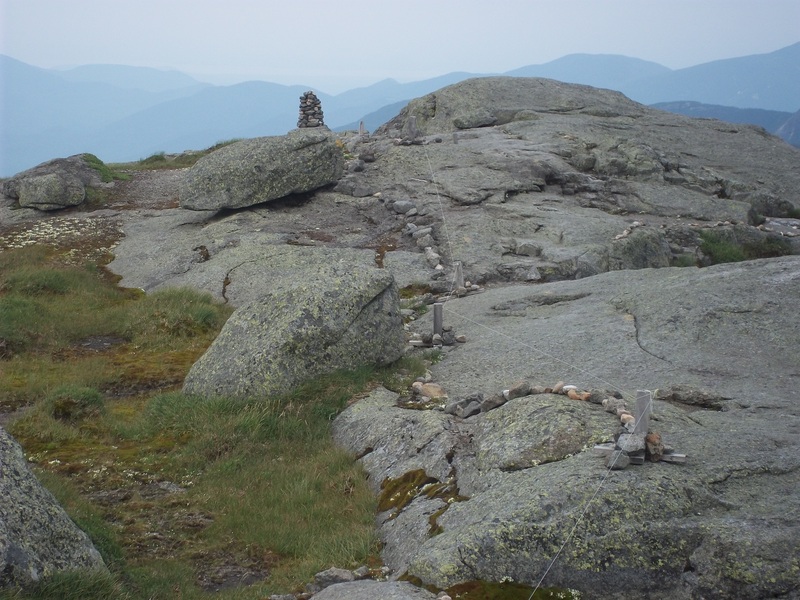 The hike up Skylight was straightforward and easy, just a half mile from the base, but rocky. 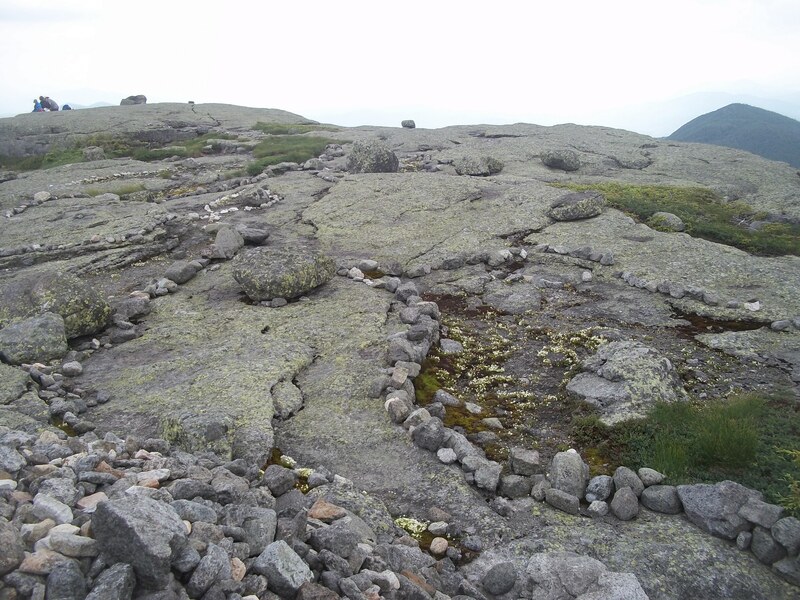 Local legend dictates that one must bring a rock to the summit to add to the enormous cairn to ensure good weather for the rest of one’s hike, so we brought our rocks; after we placed them the sun peaked out from the clouds, which I took as a good sign from the mountain gods. The Marcy summit was just .8 mile from the base of Skylight. We hiked up the steep side and WOW – the views! It was quite steep but not scary going up the open rocks – just awe-inspiring. It went on for quite a ways after we ascended the treeline and it took us a bit of time to reach the summit, though we could see it above us the whole time. It was exciting to finally be standing on the tallest point in New York State. And I’m glad we descended on the other side, which was much more gradual. Much of this loop trail, especially the second half, was very rocky and hard on the feet. We picked up my least favorite trail for the last few miles – the Van Ho, which follows an old dried up river bed and is almost all rocks. I have several spots of numbness on my toes and feet that have not subsided even a day later. I’m hoping the feeling returns before next weekend, when I’m scheduled to hike Algonquin and Iroquois. Some people opt to climb this rock face near the Gray summit. We followed the herd path around it. Awesome! And what great views – I’m so glad you made it through it. The summits look great, I can’t wait till I can do it. I loved the section between Lake Arnold and Feldspar, too, even though I was hobbling. 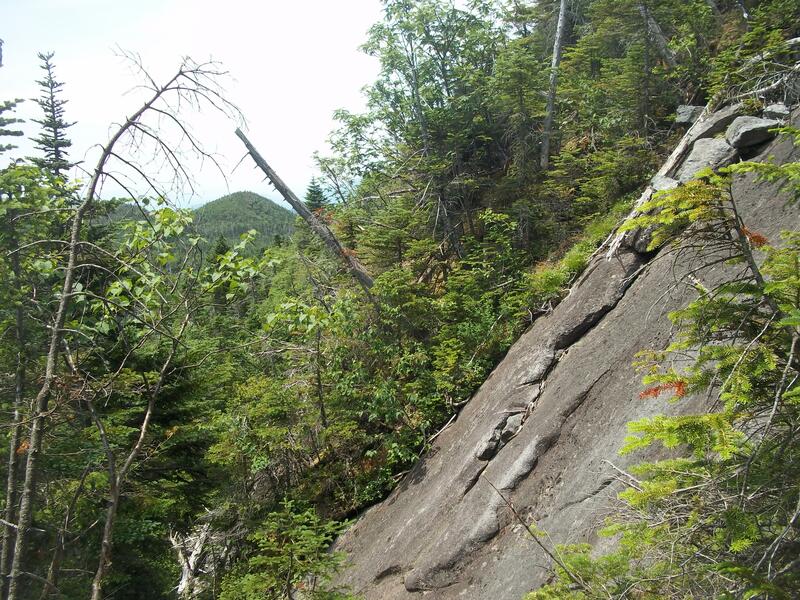 When you do Colden, consider coming back along the trail to Lake Colden, it runs along an amazing gorge. Good luck next weekend, I won’t be able to do it. I really loved hiking both Skylight and Marcy. Glad you got to see that stretch, even if you were hobbling. We’ll miss you next week – hope you’re on the mend and hiking again soon. 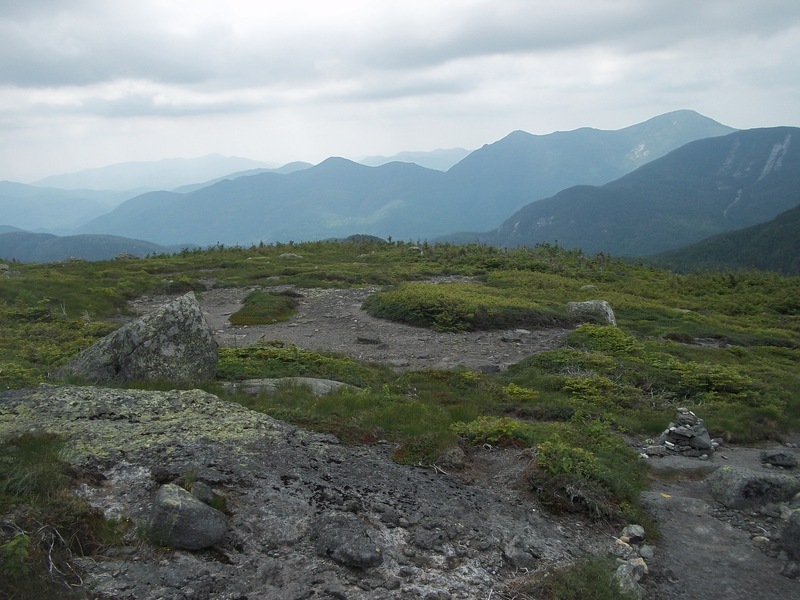 And I think I’ve decided to save Colden for my 46th; everyone seems to love it, and I’d like to end on one like that – with beautiful views, and one that everyone seems to enjoy climbing over and over again. Nice pix. I love that mountain chain silhouette view from Gray Summit. Looks like a place where you have no choice but feel at peace with the world around you. Thanks. 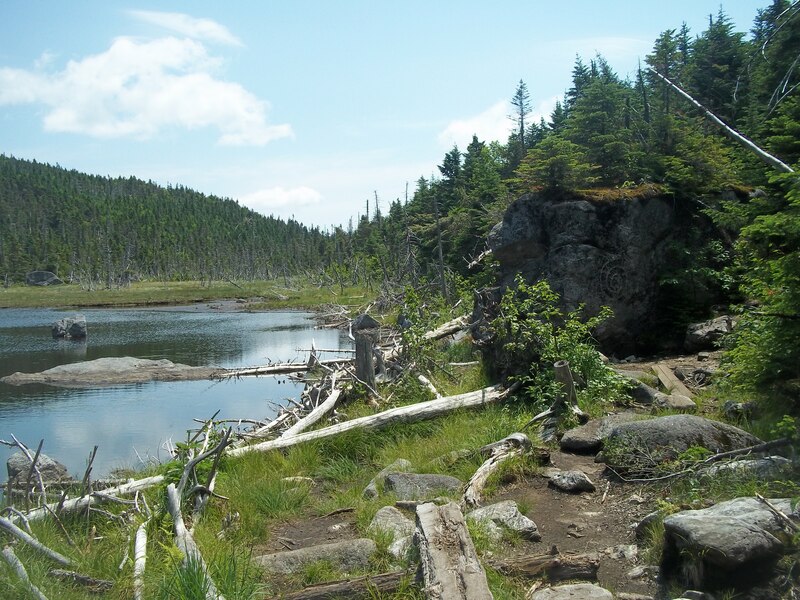 Very peaceful, in the mountains and on the trails – especially when you’ve hiked in for miles to get there. 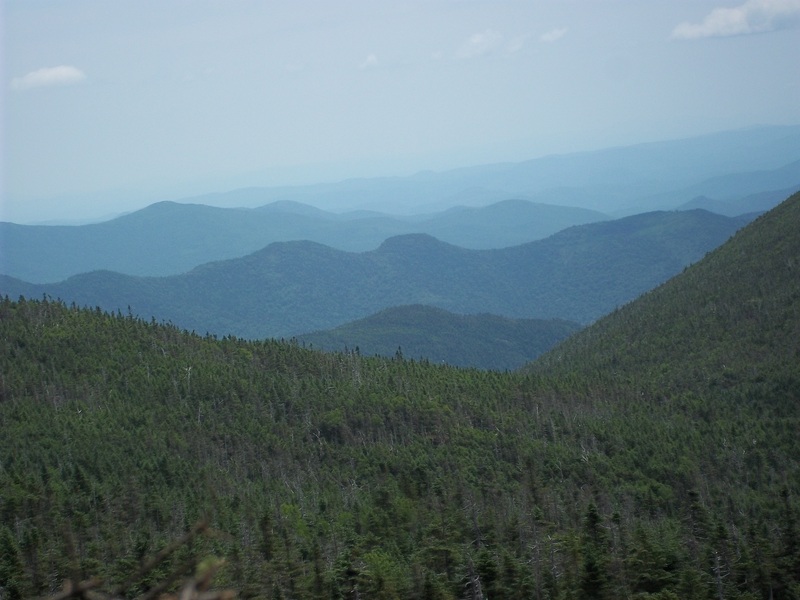 adirondack46er – Your photos and your storyline are just beautiful. Of course, I am not only saying that because I was there to share this all with you! Your descriptive account of our hike will keep those memories alive for me for a very, very long time! I had such a blast hiking with you, and I am only looking forward to more hiking with you, Be it more peaks that we both need, or just accompanying you on a peak or two that you need to get in! Hello Hikerchik46! I had such a wonderful day hiking with you too! 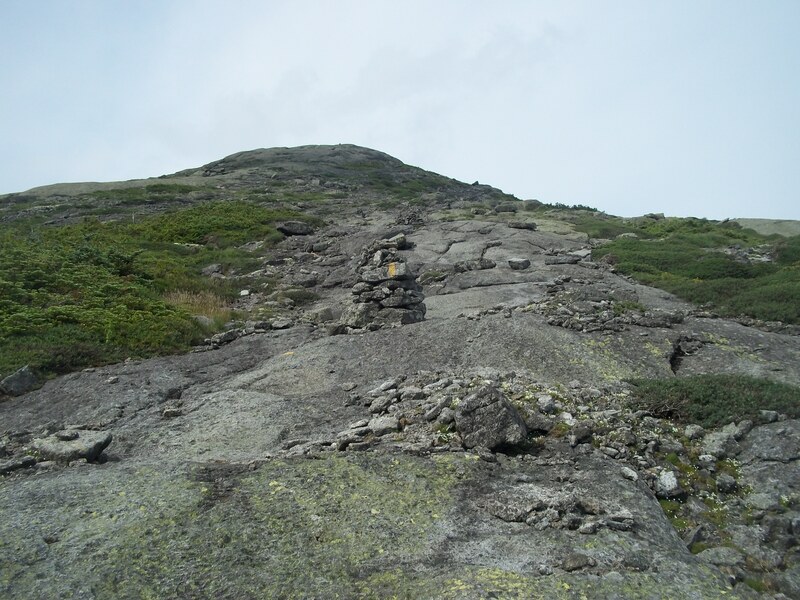 One of my favorite memories is of climbing up Marcy on those steep vertical rocks above treeline for what seemed like forever, looking at the summit above us – I wish I had better pics to capture what that looked like! I’m so glad we could share that journey together, and looking forward to more down the road. Will see you next weekend for Algonquin and Iroquois… that should be a piece of cake after what we just went through, eh?! Awesome pics!!!! It sure is beautiful in the Adirondacks. Thanks for including me on your blog. Look forward to seeing more! Congrats again in succeeding your goal to climb three mountains in one day! Thank you Suzanne! 🙂 Great to meet you and congrats on your accomplishments too. I’m dying to do that hike to Avalanche Pass – looks so beautiful. What a fun couple of days at the Loj. I guess it’s back to reality now! Looks like an awesome place to explore. I just love that kind of environment. hi, thanks. do you hike? What a great hike! I so wish I could have been along on this one! This month I seem buried in so many things…maybe we can catch up for a hike or 2 in Aug & Sept??? A long day, but a really fun hike. August and September are going to be really tough for me with my work schedule, but let’s keep in touch and try to make something work if possible! Glad to see you enjoyed the hike. Wow, so you scaled that thing, eh?! I would have cried at that point in my hiking career if I thought I had to go up (and down) it!